Life On Base: Quantico Cave by Tom & Nancy Wise Wins First In Category - Great Reading for kids. The children of our service members did not choose this life, but they too serve. Life On Base: Quantico Cave is their story published by Koehler Books. Life on Base: Quantico Cave is a riveting portrayal of the lives of children whose parents serve in the armed forces. Life On Base: Quantico Cave, written by Tom & Nancy Wise, received a First In Category in the Somerset Awards for Contemporary Literature at the Chanticleer Book Reviews Author's Conference in Bellingham Washington. Over 2 million families serve our country in the Armed Forces. The children of our service members did not choose this life, but they too serve. They wait, and they worry with a dedication to our country and loyalty to their serving parents. Life On Base: Quantico Cave is their story published by Koehler Books. Purchase Life On Base: Quantico Cave at Amazon, Barnes & Noble, or your favorite bookseller. "Anyone who wants to know exactly how base life is perceived by the young will find Life on Base: Quantico Cave engrossing and unparalleled in its descriptions of military base life's impact on family and friendships." "For a child growing up on a military base, life is different from that of the outside "ordinary" world. The children follow order and rank just as their military serving parent or guardian does. 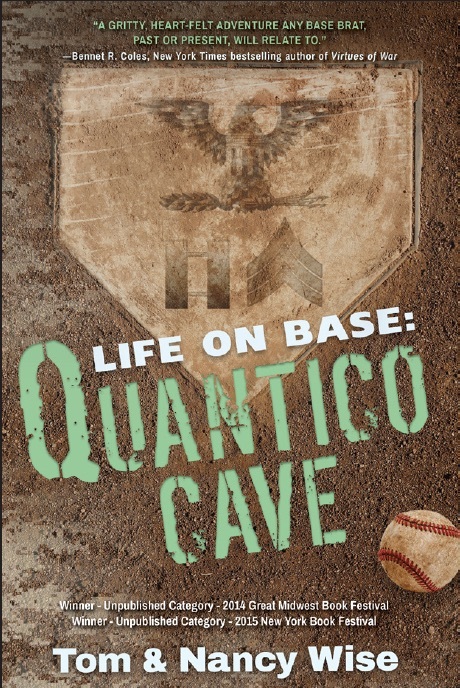 Authors Tom and Nancy Wise show this unique military up bring in their highly readable and engaging middle grade novel Life On Base: Quantico Cave." "Thomas P. Wise and Nancy Wise’s coming of age story, On Base: Quantico Cave, is marvelous. The authors explore the stresses and strains military children experience being part of a military culture." "Life on Base: Quantico Cave is a riveting portrayal of the lives of children whose parents serve in the armed forces. Being a teenager is hard enough, but adding the constant uprooting and moving from base to base adds its own unique challenges as well as rewards. Authors Tom and Nancy Wise effectively use this book, while telling a suspenseful story, to show middle grade readers that there are positive ways to handle these situations without sounding preachy or admonishing."